Ivy Nimiki is a fifteen-year-old girl with strange yellow eyes and a hole in her past. Running away from home to find answers, she embraces the missing pieces of her life just as a family curse takes hold. 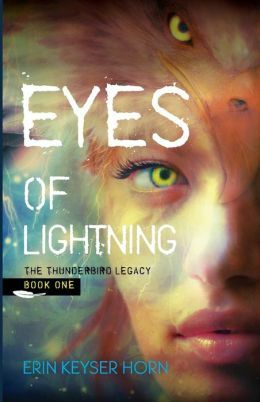 Eyes of Lightning is the story of a young girl taking chances to fight for loved ones at a time when falling in love could mean death. Horn’s ability to draw in a reader right from the first sentence carries on throughout the entire novel. Her dialogue and characterization bring you instantly into Ivy’s world, making the elements of the impossible feel like truth and not imagination. I particularly enjoyed Ivy’s duality of faith. The jarring juxtaposition of Christianity and Native American culture is handled flawlessly within the narrative. This idea pulls from the reader all of the lore ever learned in school or on the news as you internalize how this twist-of-faith can exist. This internal cataloguing and research happens in the back of your mind as only the few and varied elements are pieced together while reading. As a scholar, I found myself encapsulated not only by the story on the page but the un-written back story the world has come to know. The abilities that Ivy and her compatriots blossom into happen incognito, with a subtlety of word and poignancy of phrase that build to a point where the reader feels they have always known the truth – without spoiling the surprise at the end. What is especially powerful about the abilities that these kids develop is that they are an extension of natural aptitudes we see in daily life. I was delighted to find the author’s “play-list” at the end of the book. She pinpointed a song that most rang true in her heart for each chapter. This is not only the epitome of a teen’s experience (a soundtrack of life) but a faithful connection to Horn’s audience with music they too can identify with (and many adults, too). It is little touches such as these that infuse Eyes of Lightning with a sense of heightened reality and readily whisks readers into the heart of the story. I can’t wait to read book two, Wings of Thunder, and learn more about the curse that binds Ivy and her family.